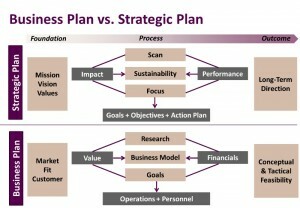 There is often a great deal of confusion about the difference between business plans and strategic plans. And, frankly, they are similar in many ways, and since each plan has to be tailored to the organization it is prepared for, one can easily blur into the other. In both cases, you begin with internal and external research (often called a “scan”) to get clarity on the best direction for the organization and where its best opportunities are to obtain the funds it needs to succeed. 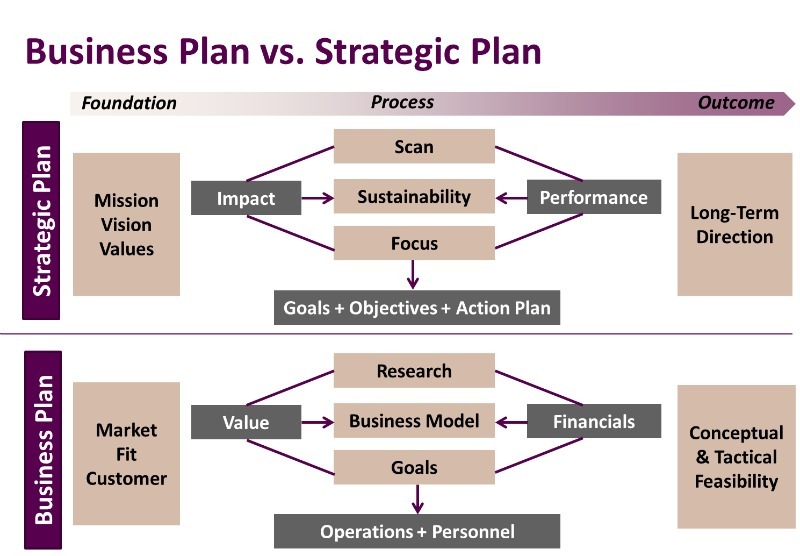 What sets a business plan apart is its singular focus on market and operational feasibility. In contrast, a strategic plan clarifies the long term direction of the organization; most business plans look at a shorter period of time, typically 2-3 years, and drills down thoroughly how the work will get done and dollars will be earned. Business plans typically take more resources, both internal and often external (in the form of consulting assistance) to develop the kinds of operational and financial analysis necessary to fully test the feasibility of business venture or an organization as a whole. It gets down to specifics about who the customers will be, what they will pay (with research backing that up), what marketing will be needed to reach them, who the competition will be, and how the finances will work out, in detail. The feasibility part of the business plans means that it’s entirely possible that the idea you seek to develop is not feasible, at least not with your current set of assumptions. While strategic plans in theory have that escape clause also, rarely is it used. Finally, a credible business plan has to include who (the skilled managers) who will carry it out. It’s not a business plan if it doesn’t include the people who will implement it. The above is a graphic from our colleagues at Social Impact Architects laying out some of these differences for the social sector.